As we all know, the iPad is the Goliath of the tablet world. Apple has 83% of the market share locked down and managed to move 3 million units of the new iPad in the first three days of its release, and they didn't even have to give it a name to do so. Personally, I like to call it Cameron. But that's beside the point. The iPad's popularity would make it easy to overlook the other tablets out there, so let's take a look at one of them: the new Samsung Galaxy Tab 2. The original Tab remains the leader in Android-based tablets, and after playing with the new model for a few days, I think it deserves to stay there. Samsung stated: "We strongly believe it's not a one-size-fits-all market." Which is clearly a jab at all the iPad-loving consumers out there. The Tab 2 packs the expected features: 7-inch screen-size, 8GB (with microSD slot extra 32GB), 3MP rear-facing camera and 1GHz dual core processor. And Samsung has especially touted a few new features. The Tab 2 runs smoothly on Ice Cream Sandwich, the latest version of the Android OS. It also offers a free 50GB of storage space on Dropbox, a $99 value. Interestingly, the Tab 2 is equipped with an IR Blaster that allows you to open a pre-installed “SmartRemote” app on the device desktop and control any nearby TV. Set-up on the TV only took a minute (and is not proprietary to Samsung TVs), but I'm not sure if the feature's user-friendliness will convince me to swap out my trusty remote. I do like the 7” form factor though, and the added portability is key. A final thing to consider is the price point. The 7-inch tablet retails for $249.99, which is $100 less than the original 7” tablet debuted for in 2010. A 10.1” (16GB) option will also be available May 13th, at $399.99. 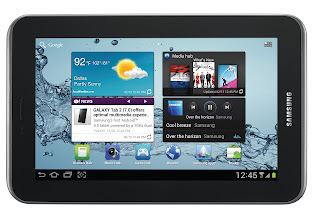 Look for the Galaxy Tab 2 in stores on April 22nd. So, I don't understand why you say the original Tab should remain the leader (in Android tablets). You didn't say why it was better than the Tab 2. Is it just the size? Maybe that was confusing... The original tab was and still is statistically speaking the leader. The Tab2, like all upgraded models, obviously has more added features.